Would you like your coffee in bags with your name on? The only commitment we need from you is an order of 30kg at a time. Here at Coffee Solutions we can provide your own bespoke blend or one of our stock blends of coffee in your own bags which you could retail to your customers if you wanted to. The bags come in a range of different styles as well as colours, the labels are printed in either a matt or high gloss finish then applied to the front and the back of the bags. All we need from you is a Hi resolution logo so we can make a proof for you. Should you decide to have your own bespoke blend of coffee we can take you on a factory tour and you can see the roasting process from start to finish. Private label sugar sticks provide a unique advertising & promotional tool through individually designed brand/logo printing. You can use paper cups to build your brand. Branded cups are great for use at events, tradeshows, and for marketing campaigns and exhibitions. 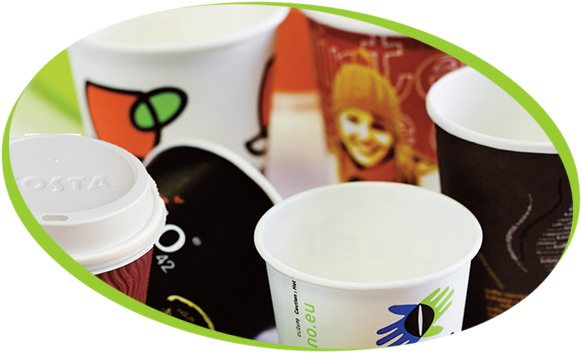 Our fast lead time and low minimum order make these cups ideal. Our Simply, Great Coffee Pods have a proven track record. Without exception all sites have seen an instant significant growth in drink sales and in most case at a higher cup price. They offer the consumer the ultimate experience in self-serve beverages. Your customer gets to make their own good quality coffee as he or she likes it, giving a satisfactory feeling at the end of the process. A true Barista experience. Designed, Manufactured, installed! Make your breakout area truly unique with our selection of standard and custom made furniture. Choice of materials from wood veneers, MFC and laminates. Integrated fridge units or glass fronted coolers. Zip taps for boiled and chilled filtered water. …all sizes, shapes, materials and budgets catered for! Concerned about a small budget or space restrictions? Feel free to contact the team or call 01223 833 661 for more information and advice on how we can help.